Llanidan is a community in south-west Anglesey, Wales which includes the village of Brynsiencyn ( Welsh pronunciation). 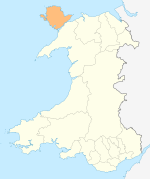 The parish is along the Menai Strait, about 4 miles north-east of Caernarfon (across the strait). The parish church of St Nidans is near the A4080 highway, a little to the east of Brynsiencyn. The ruins of an earlier parish church survive. It has been suggested that here the Roman general Suetonius landed in 60 AD, and again in 78 AD by Agricola, trying to pacify the Ordovices of north-west Wales and Anglesey, at a spot known as Bryn Beddau, ("The Hill of Graves" in Welsh). In the Middle Ages, the parish was part of the commote of Menai, in cantref Rhosyr. A Llanidan electoral ward existed, which also included the community of Llanddaniel Fab to the north. The population of the ward at the 2011 census was 1,851. Since the 2013 county elections Llanidan has been part of a new ward, Bro Rhosyr, which includes three neighbouring communities and elects two county councillors. Amongst the notable people associated with the parish are Henry Rowlands, who was the rector of Llanidan when he published Mona Antiqua Restaurata in 1723, and the industrialist Thomas Williams of Llanidan, who lived in Plas Llanidan. Also, Carwyn Williams lived here for a period of time. There is a horse stud: Llanidan Stud, which breeds Welsh ponies of cob type (section C) and Welsh cobs (section D) and is owned by E.W Jones. Near Brynsiencyn is the Anglesey Sea Zoo. Brynsiencyn is a small village, housing a few hundred people. It has a post office, shop, kebab house and pub. There is also a school and a large chapel. Wikivoyage has a travel guide for Brynsiencyn. ^ "Community population 2011". Retrieved 20 May 2015. ^ http://www.genuki.org.uk/big/wal/AGY/Llanidan/index.html Genuki transcription from The National Gazetteer of Great Britain and Ireland, 1868. ^ "Ward population 2011". Retrieved 20 May 2015. ^ "Isle of Anglesey (Electoral Arrangements) Order 2012" (PDF). legislation.gov.uk. The National Archives. Retrieved 26 March 2019. This page was last edited on 29 March 2019, at 08:02 (UTC).